Located in the famous student district, the Hotel Cujas Pantheon is housed in a beautiful eighteenth century stone building where a friendly family atmosphere awaits you. You will appreciate the quietness of the Rue Cujas and the hotels 48 nicely furnished rooms, decorated in bright colours. The hotel enjoys a convenient location, only a few minutes walk from the Jardin du Luxembourg and the Saint-Germain-des-Prés district. The Sorbonne University and the Pantheon are just a short walk from the hotel. The 48 rooms of the Hotel Cujas Pantheon are double glazed and nicely furnished and decorated in bright colours. The hotel also offers two rooms with access for persons with reduced mobility. All rooms are equipped with a private bathroom, hairdryer, air conditioning, individual heating, Satellite TV and Canal+, automatic alarm call, international plugs, extra pillows and free Wifi Internet access. Reception is open 24 hours a day. Our highly attentive staff can help you to book shows, restaurants and excursions and give you directions if you need help planning trips during your stay. Located in the renowned student district Quartier Latin, you will appreciate the quietness of the Rue Cujas. From the hotel you can walk to the Jardin du Luxembourg, visit Notre-Dame de Paris, stroll among the little side streets, or along the banks of the river Seine lined with the famous second-hand booksellers. Should you wish to travel further afield, nearby public transport makes the rest of Paris and the region easily accessible. 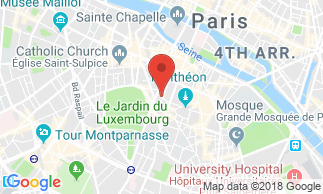 La Sorbonne University and the Pantheon are a short walk away and Saint-Germain-des-Prés can be reached in a few minutes.